If you want to surprise your sweet half for a special occasion or find a romantic spot to wine and dine during your trip to St Petersburg, you will have plenty of choices in Russia's Northern Capital. Romantic Restaurants in St Petersburg, Russia. If romance is on your dining wish list, then why not try our list of romantic restaurants listed below and enjoy both food and love. Surely you'll have a remarkable time! Tip: Make sure you book a table in advance before you go. Also, when choosing your food and beverage, the menu of the week can help you to save some money if you are on a tight budget. Some of these romantic restaurants usually have a terrace or a window overlooking the Neva River or some of the popular St Petersburg attractions, so don't be shy and ask for a table offering a good view, if available. Delicious French patisserie, Home European cuisine, Romantic atmosphere! Perhaps, one of the most romantic restaurants in the imperial city, Truffle can be a really great spot to bring your sweet half. This small French patisserie and family restaurant offers a gorgeous French Provence style design with cushions in the tables, roses and candles, warm lights, home bookshelves and a pleasant and quite atmosphere. The refined wine list coupled with unique French and Italian dishes made only from the freshest ingredients by chef Paul Bulgakov, will delight your palate and satisfy your soul. Tasty Russian food, Great staff and cozy atmosphere! Worth every penny! If your Russian ballet performance is over and you start to feel hungry, then right across from the famous Mariinsky Theater you can enjoy a tasty soup or a hearty beef stroganoff at Sadko. This is one of the most famous and romantic restaurants in the city among celebrities, visitors and of course Russians. With its imposing red chandeliers hanging from the vaulted ceilings, warm atmosphere, traditional hand-painted flowers and singing waiters, you will enjoy a perfect romantic dinner here. If you go, try the Russian bliny with red caviar as a starter! Real Italian atmosphere, Attentive staff, Yummy Italian food! Want to experience a real Italian ambience? Fancy thin and crispy Italian pizza? If so, you should book a table at Serafino, one of the best Italian romantic restaurants in the Northern Capital. The menu here is vast and appears to include every dish that Italy has ever offered the world, from marinated antipasti and risottos to a range of authentic pizza, pasta and classic meat and fish dishes. The atmosphere is relaxing and the picturesque red-brick arches recreate the typical look and feel of a real Italian trattoria. French cuisine, Charming Ambiance, High Class Service! If you want to have a great romantic dinner in true French style, then go to Legran where you will feel and eat like an aristocrat. This is a charming restaurant offering passionate French cuisine and a Russian menu in a warmly-lit and welcoming envirponment that invites you to enjoy the French fare that is their specialty. Legran's reputation for high class service and family-oriented attention to detail makes it a unique establishment. Nestled in the center of beautiful St. Petersburg in the Golden Triangle between the Hermitage and the Savior on the Spilled Blood Church, Legran is the quintessential ambassador for Russia's Venice of the North. Superb location, Pleasant atmosphere, Delicious food! More popular for its picturesque location than for its food, Giuseppe Park is another great romantic spot for lunch or dinner. Serving a variety of Italian dishes and Russian classics combined with a warm and inviting atmosphere made of soft music, candles, rose petals and beautiful Venetian masks on the wall, this restaurant and its staff will make your visit more than complete. The amazing views of the famous St. Michael's Castle and the Savior on the Spilled Blood Church from the terrace will make your dinner memorable. Great Italian food, Attentive staff, Pleasant atmosphere! Romeo’s Bar and Kitchen is the place to go for those looking to impress! Seen as one of the most romantic restaurants currently in the city, this is a modern, stylish spot serving a mix of Italian and Russian cuisine in a pleasant and relaxing atmosphere. Here you can taste some of the highest quality and reasonably priced Italian food in the city. Definitely a nice place to bring a date and enjoy a lingering meal or leisurely chat! The tasty ravioli with salmon or Beef Stroganoff with mashed potatoes combined with a good list of wines will not leave you enchanted! Amazing food, Homelike atmosphere, Well worth the money! If you are looking for a unique place for a romantic dinner, then you should not miss the small but popular restaurant Mechta Molokhovets. Considered one of the most unique romantic restaurants in the imperial city because of its delicious and rare Russian dishes, here the food is based on recipes from the famous cookbook by Elena Molokhovets "A Gift to Young Housewives" from the 1800s. Decorated in the grand style of Russia's Silver Age, you will undoubtedly be pleased by the nice piano music in the background, the warm atmosphere and creative food. 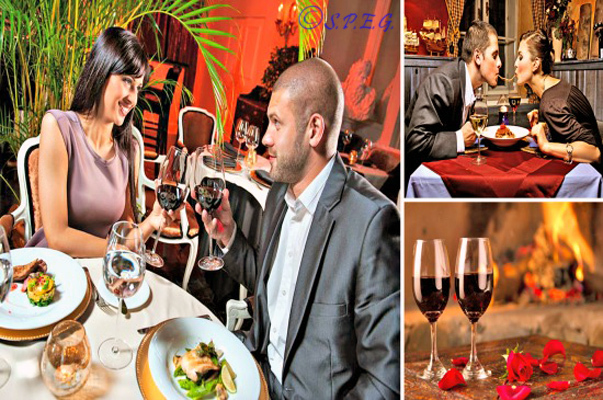 Suitable for a romantic dinner, Amazing for its Caucasian food and atmosphere! Among one of our favorite romantic restaurants in the city is Mindal Café, a quiet place offering a small terrace where you can sit and admire the beautiful view of the Neva River and taste superb Georgian dishes made by chef Marina: a local immigrant who puts a piece of her soul and Caucasian culture in every dish. The experience you will have at Mindal Café will be just like dining at the home of Georgian friends. Without doubt, this is a lovely place to relax, eat and chat, not too fancy or pricey, just perfect! Cozy ambiance, Friendly service, Delicious food! If you're looking for a cozy atmosphere that's perfect for an intimate meal, then Umao is one of the most ideal cafe restaurants in St Petersburg. Highly-regarded, Umao is known for its friendly staff, amazing food with Asian fusions and trendy décor. Lunch favorites are coffee waffles and banana spring rolls - simple, but prepared to perfection. And if you're out for an evening meal, we highly recommend the Tom Yum soup, delightful salads or veggie dumplings. With only 20 seats, Umao is small but very popular, so book ahead. Lots of space, Nice interior, Friendly staff, Very tasty! If you are in a romantic mood and want to sit alone and have no one bother you, then you should also try the new classy restaurant Pepper Moon. With its three large rooms featuring back lighting and shelves filled with troops of empty, green wine bottles, Pepper Moon can seat more than 100 people in an intimate atmosphere where customers can enjoy their romantic dinner. Offering both European and Asian cuisine with a wide range of seafood dishes cooked by a young chef and served by friendly staff, this is the most popular romantic restaurants in the city among young couples, so the right place if you seek to combine intimate feel and delicious food.